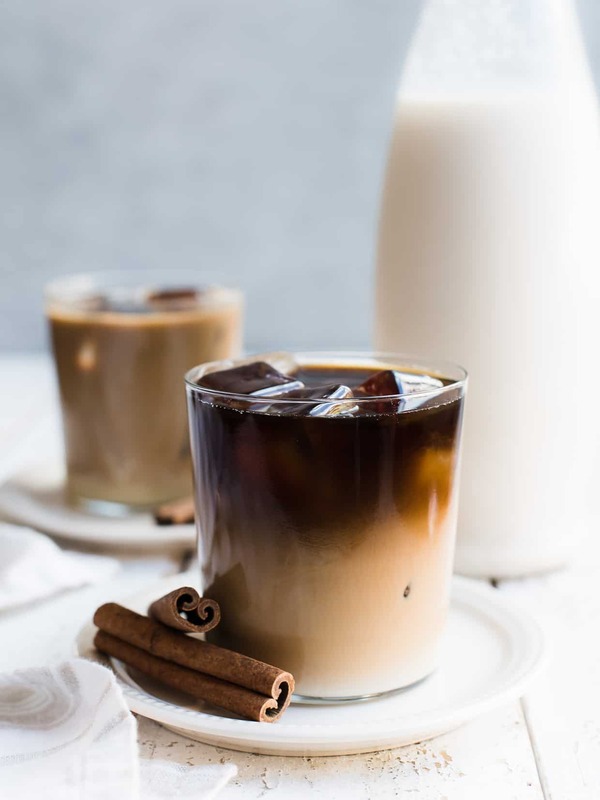 Treat yourself to a glass of Horchata Cold Brew Latte. 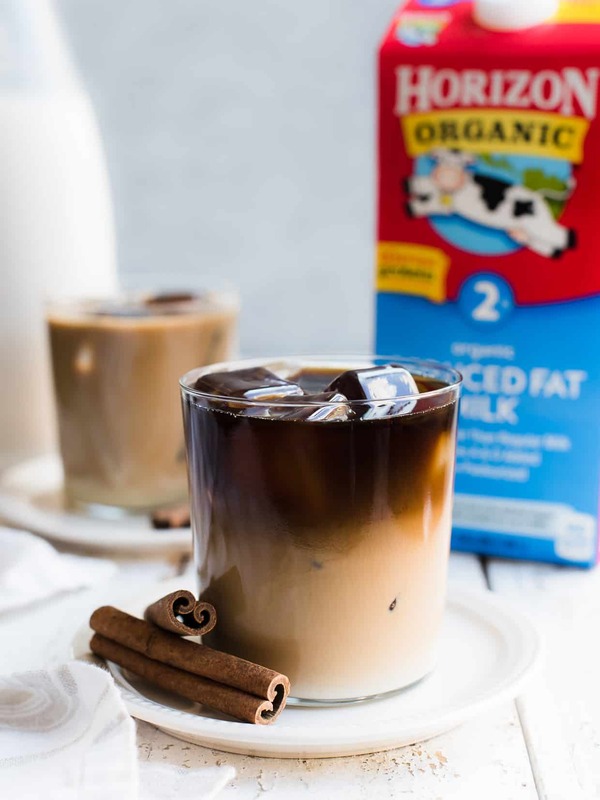 Make your iced coffee even more special by making it with homemade horchata! This post is sponsored by Horizon Organic. The house is extraordinarily still as I type, aside from the pitter patter of little kitten feet and the snuffles of Bruno, our lazy English bulldog. Just a few weeks ago at this time, my daughter would be tinkering on the piano, figuring out one of her favorite songs from Broadway, my son playing with a buddy upstairs. It was loud, and the house was full. I’m not going to lie — I was sad when they started school again! But you know what? I can hear myself think, and I actually have time to treat myself. Now that we’re all rising a little earlier, and the days feel a little more hectic, I could use a little something special — an iced coffee sounds perfect. But not just any old iced coffee, but a smooth, creamy Horchata Cold Brew Latte. I’ll never forget the first time I tried horchata, spying the large jar sitting next to the icy agua frescas at the little taqueria when we first moved to San Francisco. It was cool, cinnamon-y, and utterly refreshing. 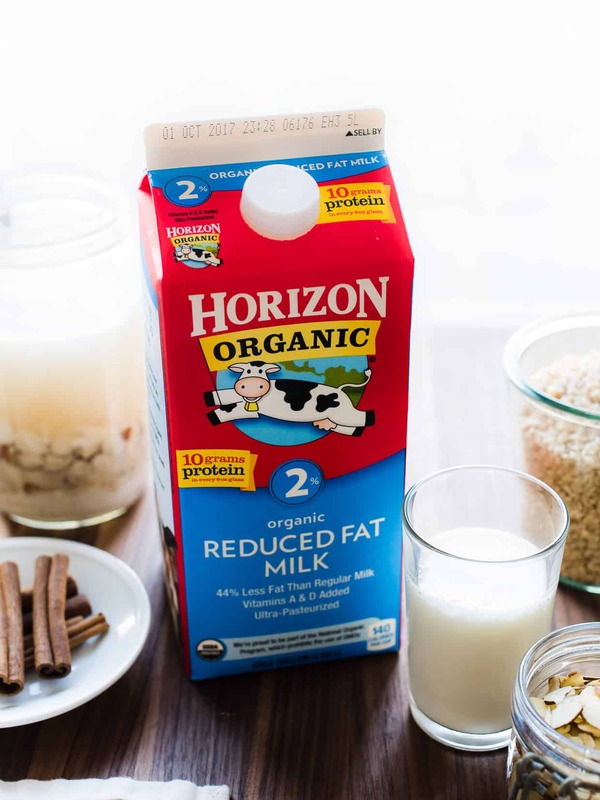 I am so excited to work with Horizon Organic to bring you this extra creamy homemade horchata; when it comes to making horchata, the variations are endless — for this recipe, I wanted it to be extra creamy, so there’s lots of good, wholesome milk, brown rice, almonds and cinnamon, of course. 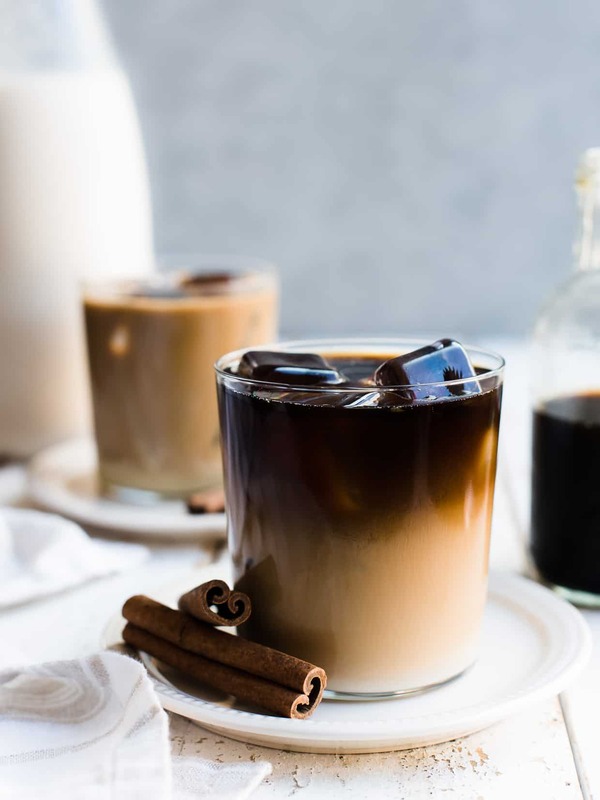 Horchata on its own is already a treat, but it becomes extra special when you pair it with cold brew coffee. With the kids back at school, and an icy glass of horchata cold brew to sip on, I’m ready for the day ahead. It’s the perfect way to treat myself…I may even go snuggle the kitties, while I’m at it. And when the kids come home, they’ll have a glass of horchata to greet them! Visit Horizon Organic for more back-to-school treats on Facebook, Instagram, Twitter, and Pinterest. 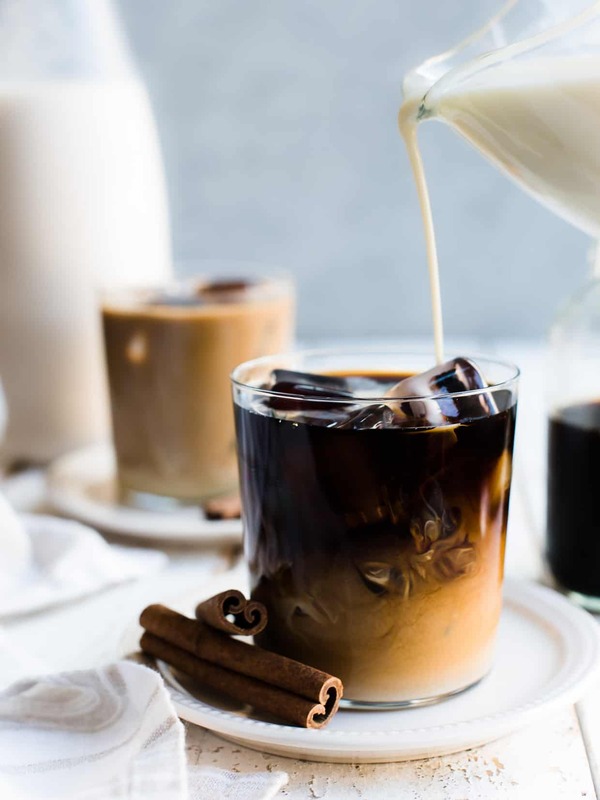 You deserve a treat — make your iced coffee even more special by making it with homemade horchata! Grind rice in a blender until fine. Remove blender jar from the motor. 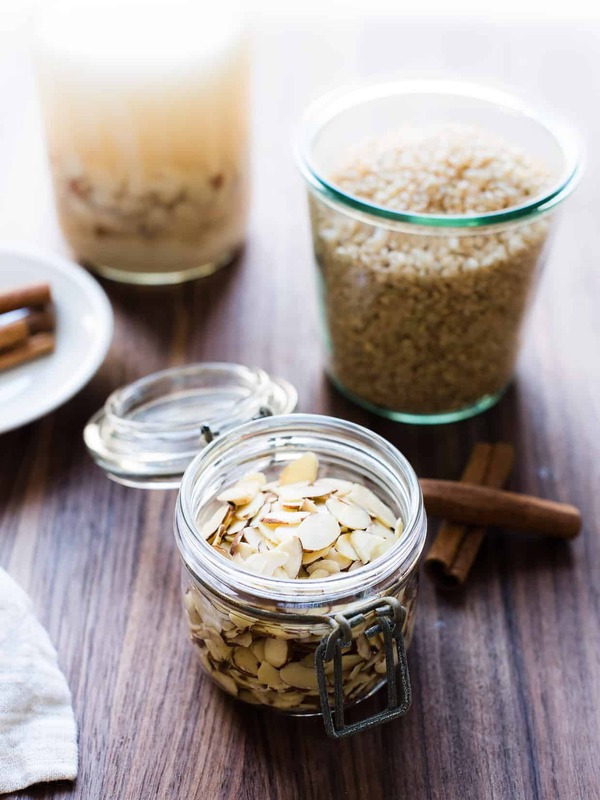 Add the almonds, cinnamon stick and hot water to the ground rice and stir with a spoon. Let the mixture cool completely, then cover and let it sit at room temperature for a minimum of three hours, ideally overnight. I keep everything in the blender jar to make things easier. After soaking, add cold milk and condensed milk to the rice/almond/cinnamon mixture in the blender then blend until smooth. If you want your horchata sweeter, add more condensed milk, to taste. Strain the milk mixture into a pitcher or jar. Refrigerate until ready to enjoy. Fill a glass with ice fill half-way with cold brew (use more if you want a stronger drink). Shake or stir horchata well before using. Stir in the horchata, garnish with a cinnamon stick and enjoy. Horchata adapted from Mexican Horchata by NoshOnIt and Homemade Horchata by Alaska from Scratch. i have not had horchata in a long time but drinking it as cold brew latte is just genius! Thanks, Dixya!! I love the unique, cinnamon-y flavor it brings to the cold brew! It’s so beautiful and I’m sure it tastes amazing! Thank you Raquel!! I love the cinnamon-y flavor it adds! These photos! This recipe! I LOVE it all! I need a new latte idea, and this is totally going to happen! loving this cold brew horchata! one of my faves! I’ve given up coffee for hot tea, but iced coffee is another story! This gorgeous latte would be a perfect mid-day pick-me-up. Your photos always wow me, Liren!! I need a new latte to try! This sounds amazing! What beautiful photos. I’m not even a coffee drinker and I want to make this! Aw thank you, that is the best compliment! These sounds so delicious! I’m obsessed with horchata! This is such a good idea! Love it! Now that is a great looking cold brew! !